Despite the promise of a political transition following the Arab Spring, Yemen nevertheless remains gripped by an intricate web of armed conflicts and troubling humanitarian conditions. The crisis in Yemen is not improving, said Trond Jensen, the head of the UN Office for the Coordination of Humanitarian Affairs (UN OCHA) in Yemen. He detailed the troubling humanitarian situation, noting in particular the impact on children. Humanitarian efforts have faced significant challenges to providing aid to areas mired in conflict. Given the political transition in Yemen, a serious dilemma for humanitarian organisations has been how to remain politically neutral amidst donor pressures to support the process, noted ODI’s Steve Zyck. Saferworld’s Saleem Hadaad detailed the challenges within the political transition itself, emphasising the need to understand both the formal process (including the National Dialogue) as well as the informal process (affected by continuing political and sectarian grievances and conflicts, detailed in this infographic of the different armed groups). Another challenge to humanitarian action in Yemen has been attacks against aid workers. Surprisingly, many attacks are not politically motivated, Michaël Neuman of Médecins Sans Frontières noted, but rather a result of poor relationships between the affected populations and aid workers and, in terms of health-based humanitarian efforts, poor perceptions of doctors in Yemen. Helen McElhinney outlined how the UK government’s Department for International Development (DFID) has sought to change its standard way of working in the face of these challenges. 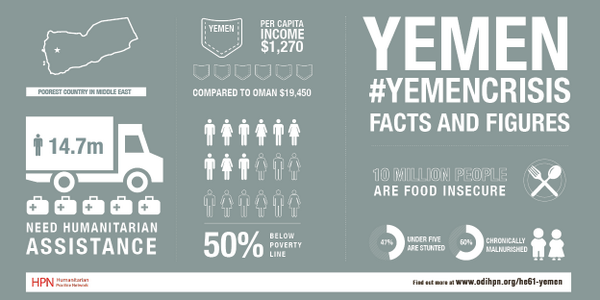 Along with piloting multi-year humanitarian funding – which allows agencies to better plan their work, build national capacity and help transition to longer-term support – DFID has used third-party monitoring and cash transfers to overcome some of the obstacles to humanitarian action in Yemen. Trond Jensen concluded by emphasising the need for both humanitarian and development engagement in Yemen to address the long-term consequences of humanitarian suffering.